Imagine you have just been punched in the stomach. Really, really hard. And just then – as you stand there winded and struggling to breathe – this particular thug knocks you sideways with one HUGE thump. That’s the only way I can describe how I felt walking out of a screening of the painfully sad film, from Wash Westmoreland and Richard Glatzer, Still Alice. Bearing in mind we all know the beyond hideous symptoms of Alzheimer’s, perhaps the cruelest of all neurological disorders, it will come as no surprise to any of you that know me that is my Single. Biggest. Fear. Nothing could be worse than drowning in the confusion of declining brainpower. Julianne Moore’s performance as a professor at Columbia University is nothing short of astounding. I’d even go as far as… spellbinding. As the disease starts to take over her mind she boldly tells her husband John (played by Alec Baldwin) that she would rather have cancer. Quite a claim but I do see her desperate point. Watching Alice as she tells her children of her diagnosis, warning them of the genetic fear (one which lies so close to my heart) and struggling to continue to communicate with them and the rest of her world, as the months turn into years, is nothing short of pure agony. This powerful, well-respected, ambitious working mother and loving wife is rendered… well…undignified as she loses her mind and identity. But – as the title begs –is she still Alice to her nearest and dearest? As the disease takes over, how much of the professor, the mother, the wife remains? Is she simply a sum of the symptoms of dementia? I thought seeing this film and then writing my review might cure my fears of dementia. A bit like subjecting yourself to a snake documentary to over come ophidiophobia. But – no – I am inconsolable, at least for this evening. But please don’t avoid the film for this reason, it is beautifully constructed and, of course, focuses on a thoroughly crucial topic. So, with renewed respect for any family members living with a loved one suffering as Alice, I’m off to bed remembering the film as I go. 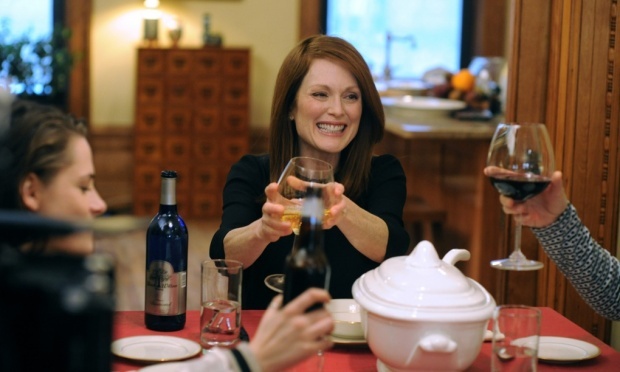 Still Alice is now on national release. How brave are you for going to see it. I loved your honest, smack in the face truthful review. My uncle died of Motor Neurone Disease and I simply couldn’t go and watch the Stephen Hawkins movie. I will watch Still Alice but with caution. Thank you.